What’s better than sipping on a nice cocktail while picking at a variety of food? A little bit of this, a little bit of that. Some meat, some cheese, some veggies. The classic antipasti platter is simple and low maintenance, yet can be presented in a really beautiful way. Done right, the platter will have a good mix of cured meats, aged cheeses, fresh fruit, and veggies. You may also find fresh baked bread and small servings of condiments like jams, preserves, honey, or tapenades. Today we’re giving you our must list for the perfect, crowd-pleasing antipasti platter. Salami: We recommend using 2-3 types of salami. Choose one that is mildly peppery and another that is spicy and fatty. Prosciutto: Splurge on prosciutto di Parma or prosciutto di San Daniele. They’re the most famous because they’re the best. One difference to note is that prosciutto di San Daniele is a touch sweeter because less salt is used during the curing process. Mortadella: By now you know how much we love mortadella. This smooth and creamy meat has just the right amount of fat to balance out the other two meats and the cheeses you’ll be pairing it with. Bresaola: This cured meat is easily recognized by its dark, ruby red hue. It’s best paired with Parmesan and a squeeze of lemon juice. Pecorino Romano: It’s salty and it’s sharp, making it a perfect cheese to round out the fatty meats above. Pro tip: It also pairs well with a Negroni. Taleggio: This funky and stinky cheese is soft enough to smear on a piece of crusty bread. It’s a stronger cheese, so if you do use it, make sure to include a couple of milder cheeses on your platter. Mozzarella di Bufala: And here’s that mild cheese you’ll need. Often served on its own with tomatoes, basil, and good olive oil, mozzarella is a wonderful addition to any antipasti platter. Figs: Whether you use Black Mission, Brown Turkey, or another variety of fig doesn’t matter. But what does is that they’re ripe. Pears: Just like figs, make sure to find a ripe and juicy pear. Slice it thin, and if you need a little more sweetness on your plate, drizzle the pear with some local honey. Olives: Choose your favorite. We like a mix of Castelvetrano (bright green, meaty, and buttery), Gaeta (dark purple, citrusy, tart), and Cerignola (large, mild, buttery). Roasted Red Peppers: Although you can buy some pretty decent ones in jar, we recommend making them at home. Trust us, they’re incredibly easy to make. Artichoke Hearts: Here’s when you will want to seek out a canned or jarred version. Look for the roasted ones and serve with a generous drizzle of olive oil. Bread: All you really need is a good crusty loaf. Slice it nice and thin, but make sure it’s sturdy enough to support the cheese and meat you’ll be adding to it. The bread is the vehicle for getting all these little treats into your mouth. The best thing about making an antipasti platter is that there are no rules. Just add a lot of what you like and make sure it’s the best of the best ingredients. Quality over quantity whenever possible, but make sure the platter you’re serving is quite full! There’s no harm in drizzling some high-quality extra virgin oil over the goodies or even some chopped fresh parsley. 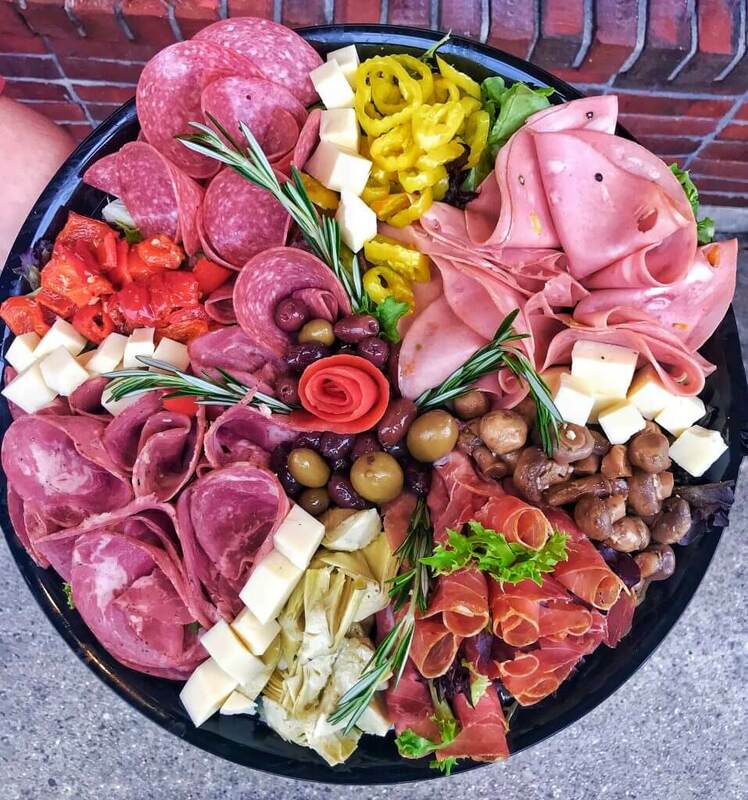 Get creative and use this as a canvas to paint the most beautiful antipasti platter you can imagine. Don’t want to make your own at home? Order the Meat Sweats from Mortadella Head! !